In this tutorial we will cover how to create and adjust JCMs or Joint Controlled Morph. This article is the first in a five-part series. First, pick the Shoulder Bend parameter Control and set it at its limit of -35. This will be the base we will use to make the corrective morph. Make sure that the new character morph Goblin is applied to its full strength of 100 percent. There are some settings that need to be taken care of before the model is exported. Start by making sure Genesis is selected, then switch to the Parameters Pane. Next, click on General and select Mesh Resolution. Set the Resolution Level to Base, and the Subdivision Level to 0. (See Illus. 2). Note: When naming the Joint Controlled Morph, use distinctive naming for the JCM by adding the character name, to differentiate the new character morph from other morphs loaded on Genesis. The Goblin used the name JCMdrGoblinRShldrBndUp. Breaking this down: JCM (type of corrective) dr (artist initials) Goblin (Name of character) R (designating right or left bodypart) Shldr (the name of the joint) BndUp (the type of movement and direction of movement) This makes it clear in the property editor what the control does, and what character it belongs to. Adding the artist initials may seem like overkill, but if someone else should release a goblin character that happens to have a JCM named the same, it could cause problems with loading the wrong JCM for the character. In your modeler, make the morph to correct the joint issue in the shoulder. When the morph is completed, make sure that the new character in DAZ Studio is still in its original position. Ensure the R Shoulder is bend at -35, and the Goblin morph is applied to 100 percent. Basically, what is in the scene should match what was exported out. The new JCM by default loads under Morphs/Morph Loader. Set the limits of the control by clicking the small gear on the parameter control. (See Illus. 6) Choose Parameter Settings and a dialog box will open. Change the Min Limit to 0. The JCM only works from 0 to 100 percent. Select Accept. One thing to keep in mind, leaving limits on in negative values will cause problems when the shoulder joint is bent in the opposite direction. It's best to get in the habit of changing the limits at the onset. Check the morph and make sure it is not moving any other part of the model. If so, there is a good chance that the model is not in its original exported out position. Reposition Genesis to match up the exact original exported pose, also check to make sure you have not applied any other morphs or adjustments from your original. Import in the morph again using the above steps, and see if that takes care of the issue. Now the new JCM has to be hooked up to the rotation of the R Shoulder. For this example it will be done manually through Property Editor. First, think about how this new JCM needs to operate. 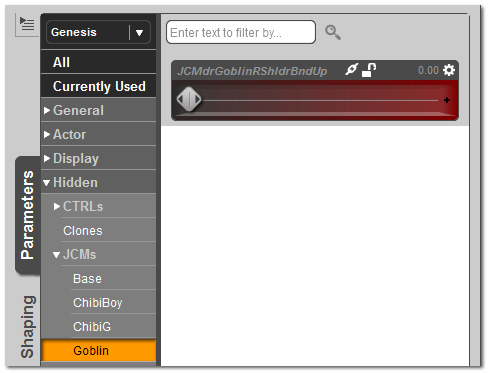 It must only operate when the new Character Goblin is applied,(it should not apply on when Genesis or a different character morph is applied, unless the Goblin Control is mixed in). It must only operate with the R Shoulder Bend Control, in the negative values only. It needs to apply gradually to 100 percent as the R Shoulder bends upward to -35 degrees. On the left side, locate the new JCM that was created for the character. It should be found under the Morphs, Morph Loader Pro... section. If it is not there, click on the Menu and use the Refresh Pane option to bring it up. This will take care of criteria 1. The morph must only apply when the Goblin morph is turned on. The multiply option will not scroll on the Goblin morph, but now the link will work only when the Goblin morph is applied. Note that under Link Attributes the default ERC Type is Delta Add. This is the correct setting for this link. Do not change it. Remember that we set the limits for the JCM earlier so it works only from 0 to 100 percent. This prevents the JCM from turning on when the shoulder is bent in the positive direction. For criteria 3, the morph needs to apply gradually, and reach its full value at -35. Here comes the fun part. Math! Under link attributes, you will find a Scalar Value. For this morph, we need to change it from the default setting l.
To get the correct value, divide 1 (1 = full strength) by 35 (35 = the limit of the shoulder bend up.) The resulting answer is 0.0285714285714286. DAZ Studio only needs 6 numbers past the decimal point, so we can delete most of this and simplify to 0.028571. The shoulder bend up is in the negative, so a negative sign needs to be added to our value, giving us -.028571. This is the final value that is put in the Scalar Value box. You will note that when this 6 digit value is entered, DAZ Studio appears to round it up, but it is still using this 6 digit number. Not going back at least 6 digits past the decimal point may introduce errors and the morph may not apply to the correct strength when it reaches -35. Criteria 3 has just been fulfilled, and these links must now be tested. Close Property Editor. To test the JCM, Zero out the figure and the new character morph. Bend up the shoulder to -35, and scroll on the new character control. Check to see if the JCM Control is reading 100% strength. Bend the R Shoulder down to half at -17.5. The JCM morph should read 50%. Return the R Shoulder to -35. Remove the Goblin morph completely. The JCM should also reset to 0. These same steps are the completed for the L Shoulder JCM. NOTE: The workflow for all of the joints on a figure are the same for any areas needing a JCM. Use the new character morph as the Multiply. Remember to add the - sign if the joint that needs to be corrected has a negative value. In this final step we will do some clean up as well as finalize the location of the JCM. All of this can be done in the Parameter Settings. Refer to Step 3 if you need help getting back to Parameter Settings. JCMs are only meant to correct joint issues. They should never need to be applied by the end user. For this reason, it is best to hide the control and place its location in a hidden category, to make it clear to the end user that it is a morph that should only work in the background. While here, set the content Type. Click on the arrow, next to the Type text box, and choose Modifier/Corrective from the menu. You can also type it in manually, but by choosing the closest path first, you are more likely to avoid typing errors. You are now done editing your JCM. Choose Accept to close the Parameter Settings. This finalizes the JCM creation. At this point, any work you have done will be lost if you close DAZ Studio or start a new scene. You must save your MCM. If you need to learn how to save morphs, please refer to the Saving Morphs (WIP) 2014 article. Here you will learn the different saving options available and select the one that best fits your workflow. This completes the first tutorial in our series. When you are ready, continue on to the rest of the Advanced Character Creation series, linked below.